If you’re looking for a new keyboard, and you’ve also got an iPod or iPhone, Razer’s ProType aims to clean up some desk clutter by combining a full-featured keyboard with an iPod dock. It’s an interesting idea that mostly works well, but it does have a few minor issues. At 20.2 inches wide by 8.7 inches deep, the ProType is perhaps the largest keyboard I’ve seen—so large that on at least one of the keyboard drawers I tested it with, the ProType didn’t leave enough room on either side for sufficient mousing space. The good news is that most of the left-to-right space is put to good use, as the ProType includes lots of special keys and buttons (discussed below). On the other hand, while part of the ProType’s additional front-to-rear size is due to the presence of an iPod dock (also discussed below), over two inches of that dimension are taken up by the keyboard’s non-removable wrist rest. And that wrist rest includes a large, pulsing-blue-backlit logo that serves no real purpose. The ProType is thin—just under one inch at the thickest point—with no incline, making for a fairly ergonomic setup (assuming your desk area is set up properly); two pop-out legs can raise the rear of the keyboard almost half an inch if desired. As part of its thin design, the keyboard uses laptop-style scissor-switch keys, rather than the dome-style key switches usually found in desktop models. Scissor keys tend to require less force and less travel—the distance you have to press a key for it to register—than dome keys, although the ProType’s keys required more travel than any other scissor-key keyboard I’ve tested, and the key response was a bit softer, with less tactile feedback, than I would have liked. Still, the combination of a low profile and easy-to-press keys provides relatively good ergonomics. The ProType connects via USB and provides two downstream USB ports for connecting low-power peripherals such as mice and other input devices. The ProType provides the full complement of standard keys, including the traditional QWERTY section; a numeric keypad; 12 function keys (F-keys), properly arranged in groups of four and separated from the QWERTY area; the forward-delete/home/end/page up/page down group; and an inverted-T group of directional arrow keys. Unlike some keyboards, nearly all of these keys are positioned normally, with two minor exceptions: the directional arrows are shifted partly below the right-hand shift key, pushing the right-hand modifier keys slightly to the left; and, like Logitech’s diNovo Edge, Mac Edition, the forward-delete/home/end pod is arranged vertically, so the home and end keys are above the forward-delete, page up, and page down keys. On the other hand, like most keyboards designed to work with both Macs and Windows PCs, the option and command keys have Windows labels: alt and start, respectively, on the left side, with an alt key and a Razer-icon key (a Windows menu key when used with a Windows PC) on the right. However, once you install Razer’s ProType software drivers, covered below, these keys work as properly placed Mac modifier keys. The ProType also includes several additional keys, in the upper-right corner, that are mostly useless when the keyboard is connected to a Mac: insert, print screen, scroll lock, and pause break; the last key has an eject icon, but, as with most Mac keyboards these days, F12 is actually the eject key. The ProType makes up for these useless Windows keys by adding 26 additional special-feature keys. Along the left edge of the keyboard are power, home, rotate, zoom in and out, and 100 percent keys. Pressing these keys, respectively, brings up the Mac OS X sleep/restart dialog; opens your home page in your preferred browser; or rotates or zooms (in, out, or to 100 percent) the image view in your preferred image viewer or editor (Preview, by default). On the right edge of the keyboard are media player, play, stop, back, forward, shuffle, volume up and down, and mute keys. Pressing these buttons launches your preferred media player (iTunes by default); controls playback; changes volume; and mutes audio, respectively. Using the ProType software—configurable via System Preferences—you can choose your preferred image program and media player. There are also 10 macro keys—L1 through L5 on the left side of the keyboard and R1 through R5 on the right side—that can be assigned custom functions using the Razer software. Each macro key can be configured to launch a program or to replicate a series of up to eight actions (keystrokes or keyboard shortcuts); you can include delays between the keystrokes, if necessary, although a delay counts as an action. Interestingly, the 10 macro keys (and the Profile key, noted below) are all lit with a soft, blue backlight that shines through each key’s label and around its base. In testing the ProType with several computers, the macro and profile features worked well, and I found them to be very useful for automating frequently-performed tasks. Gamers will also love these features, which is fitting, given Razer’s gaming background. However, there are two minor drawbacks here. First, the eight-action restriction for macros is a bit limiting; if you’ll be using the ProType’s macros to help streamline repetitive tasks, you may find yourself wishing for more flexibility. Second, you have to remember what each macro key does in each profile. I found myself reminiscing about the days of pre-mouse Word Perfect, which provided a keyboard overlay to keep track of which keys did what. It's also worth noting that I couldn’t get the ProType’s special keys to work when I connected the keyboard to a MacBook Air—using just the keyboard USB connection—despite reinstalling the ProType software several times. Given that the keyboard worked fine with every other Mac I tested it with, I chalked this up to an issue with the MacBook Air. The other unique feature of the ProType is its built-in iPod dock. 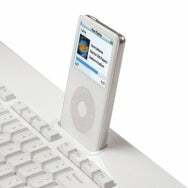 Once the keyboard is connected to your computer you can charge your iPod (or iPhone) and sync it with iTunes by placing the iPod in the keyboard’s dock cradle. The dock uses Apple’s Universal design, so any recent dockable iPod, or either iPhone model, will work with the ProType using the dock adapter included with the iPod or iPhone. (Razer includes two adapters for older iPods; specifically, adapters 4 and 5 for the 20GB and 40GB 4th-generation full-size models, respectively.) A nice touch is a line-level audio-output jack on the back of the keyboard for listening to your iPod’s music through a nearby stereo or computer speakers. Razer’s ProType is a truly unique keyboard. Its many specialized and programmable keys offer both convenience and efficiency, especially if you take advantage of the macros and automated profiles to enhance your workflow. And the integrated iPod dock can help reduce the clutter on your desk. However, the ProType makes some demands of your desk and your Mac: it requires a large swath of your desk, overhead clearance for your iPod, and two of your Mac’s USB ports. Those who don’t need the built-in iPod dock may find themselves wishing Razer’s smaller, keyboard-only models—several of which provide similar macro and profile features—worked with the Mac.